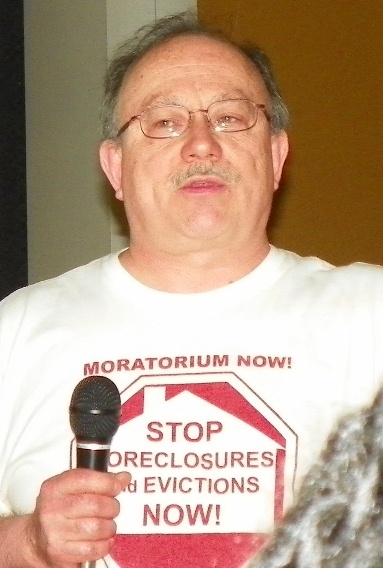 Retirees and residents protest at bankruptcy court hearing Aug. 19, 2013. 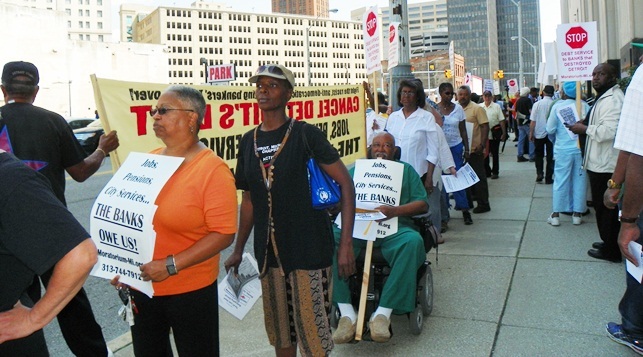 DETROIT – Dozens of individual objectors to Detroit’s bankruptcy filing joined forces with the “Official Retiree Committee” during morning and afternoon hearings Sept. 19, to call for a stay on eligibility proceedings until a higher court can hear key constitutional matters, and to demand dismissal of the case. 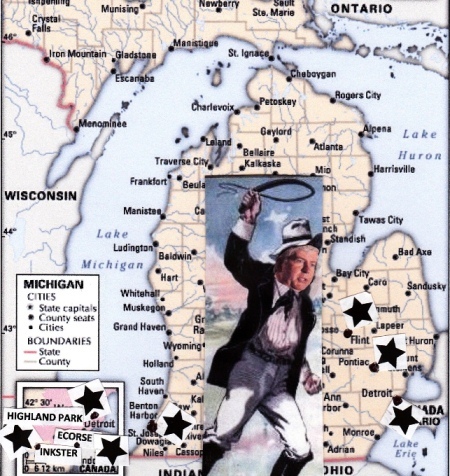 Slavemaster Rick Snyder attacks Michigan’s majority-Black cities with EM laws. Sheila Johnson, a city retiree with 28 years, wept during the 10 a.m. session for individual objectors. She said her husband has run a business in Detroit for the last 40 years, providing jobs for up to fifteen families. U.S. Bankruptcy Judge Steven Rhodes said he will rule on the Retirees’ Committee motion request, argued during a 3 p.m. hearing, within the next several days. 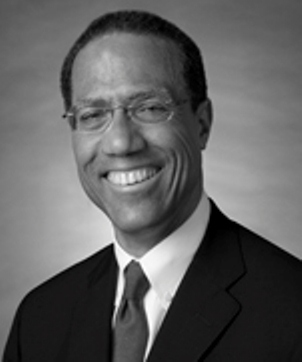 Retirees Committee attorney Claude Montgomery of Dentons LLP. The eligibility objections are key in the bankruptcy, attorney Jerome Goldberg told VOD, because once the judge confirms eligibility, the case largely moves from the realm of state law to federal law, which has no protection for public pensions. EM Kevyn Orr “not the sharpest knife in the drawer”–bankruptcy objector Hassan Aleem. During the morning session, many individual speakers demanded outright dismissal of the case, questioning the authority of the city’s unelected Emergency Manager Kevyn Orr and Gov. Rick Snyder’s to file what they said is a bogus case riddled with fraud by the banks and corporations which have devastated Detroit. They also said they have been denied due process, being notified of the filing only days before the eligibility objection deadline, if at all, and were therefore unable to find attorneys in that time. Following are in-depth summaries of many objectors’ remarks, which were skimpily reported in the daily media. They are in alpabetical order, as they were taken in court. 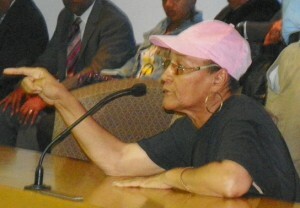 The entire hearing can be heard on the court’s website at http://www.mieb.uscourts.gov/apps/detroit/DetroitAudio.cfm. 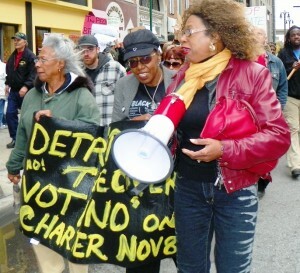 Objector Dempsey Addison (r) with (l to r) Chris Griffith and Cecily McClellan at first Occupy Detroit march in 2011. 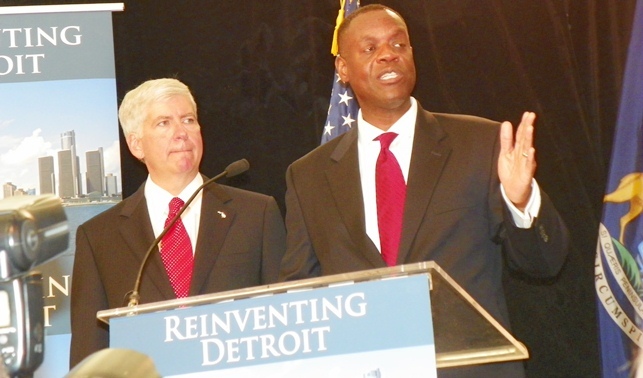 The Detroit Free Press reported Sept. 22 that a poll has shown 75 percent of Detroiters strongly oppose any attack on city pensions, which Orr and Snyder have repeatedly said in public and in private emails is a prime goal of the bankruptcy filing. If they are successful, cities in other states with constitutional public pension guarantees across the U.S. face a domino effect, according to many observers. U.S. Pres. 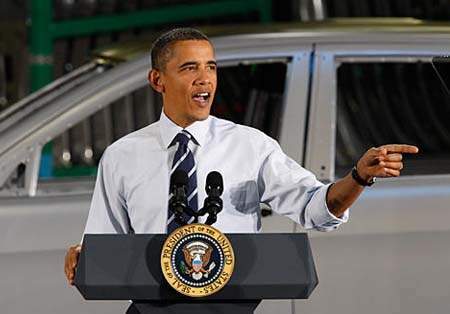 Barack Obama at Detroit area Chrysler plant after company declared bankruptcy in 2010. The feds bailed out GM and Chrysler with billions of taxpayer dollars. Officials from U.S. President Barack Obama’s administration including Attorney General Eric Holder, Housing and Urban Development Secretary Shaun Donovan, Transportation Secretary Anthony Foxx, and Gene Sperling, director of the White House National Economic Council will be in Detroit Sept. 27, to meet with “state and local elected officials and community leaders,” according to the Detroit News. Ironically, Detroit Mayor Bing and City Council President Saunteel Jenkins have said they are hoping for an outcome to include federal grants to the city. 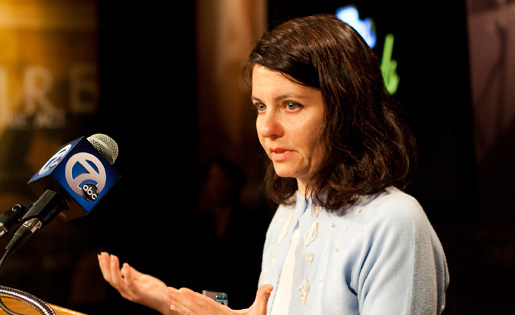 However, Bing initiated the shutdowns of the three departments, supported by Jenkins and the Council majority. Bellant pointed out the constant elimination of city workers from all departments is eroding the retirement systems’ funding base. 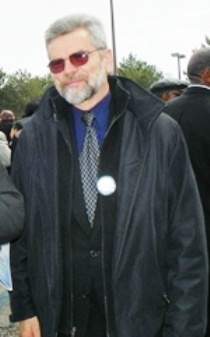 Attorney Charles Brown testified that the global Jones Day law firm, Orr’s former employer and now the city’s hired legal guns, has “financial and ethical” conflicts representing Detroit in the bankruptcy, since it also represents most of the city’s major corporate creditors in other cases. Jubilee is a concept originating from various religious sources world-wide that calls for the people’s debts to be forgiven, among other provisions. Moratorium Now! 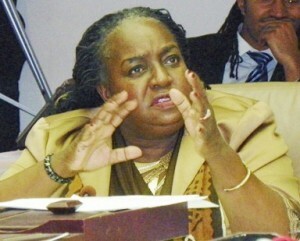 demands cancellation of city’s debt May 9, 2012. Paulette Brown said she just retired from her position as Manager I in the city’s Wastewater Treatment Plant. 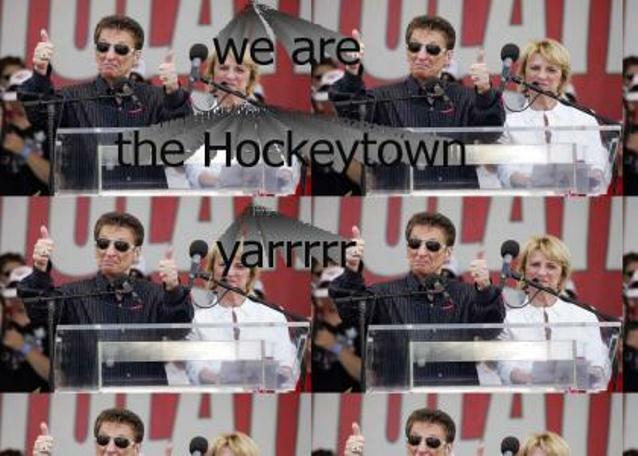 Mike Illitch plans to build $881 million hockey stadium complex as Detroit goes through bankruptcy. Louis Dukens, an architect, decried the devastation of the Detroit Public Schools under emergency managers. He said architecturally sound and beautiful schools have been demolished to build inferior structures, benefiting contractors, citing Martin Luther King, Jr. High School as an example. “The city is not bankrupt,” said David Dye, citing Detroit’s 2012 Comprehensive Annual Financial Report (CAFR). He said debt not due until the future has been invalidly included in the claimed budget deficit. 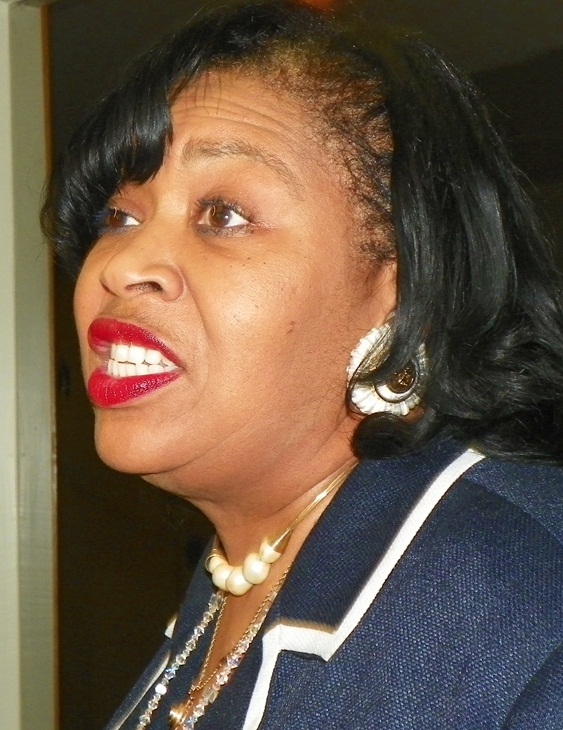 JoAnn Jackson is the wife of a city retiree. Objector JoAnn Jackson testifies at City Council hearing on hockey stadium Sept. 5, 2013. 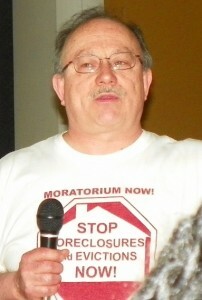 A number of speakers including Lou Ann Pelletier noted that “pensions are not a debt but a binding obligation entered into with good faith by city workers.” Pelletier also noted that the likely majority of retirees are women and people of color, constituting a protected group of people under the Civil Rights Act of 1964. Objector Sam Riddle stressed that current cases initiated by AFSCME and the NAACP challenging the constitutionality of PA4, currently pending in federal court in front of U.S. District Court Judge George Caram Steeh, should be expedited and heard before the bankruptcy case. 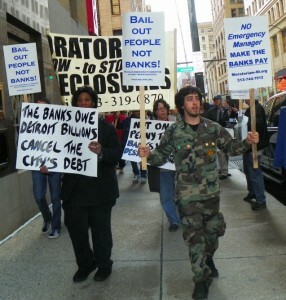 Objector Mike Shane at rally vs. banks May 4, 2013. Attorney Tom Stephens testified, “The bankruptcy court is not the proper forum to litigate the issues [including the constitionality of PA 436]. The bankruptcy has been shoved down our throats through the Jones Day/Orr form of government. 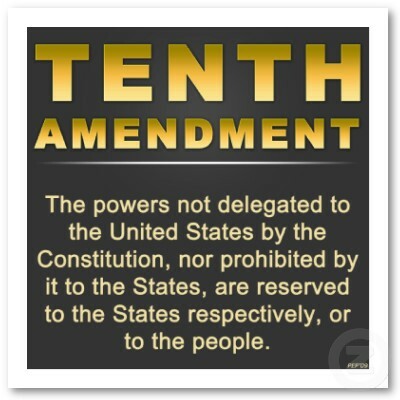 It is well established that courts have the power to stay proceedings pending other judicial proceedings,” referring to the AFSCME and NAACP federal challenges. Jean Vortkamp related a recent incident in her community where a young man who had been shot to death lay in the street for five hours while hundreds of his family members and friends gathered. Retiree William Curtis Walton said he retired early under duress. Detroit City Council members JoAnn Watson and Brenda Jones also testified. Watson referred to the 1998 agreement between former Mayor Dennis Archer and former Gov. John Engler which guaranteed revenue-sharing payments to the city in exchange for the city’s giving up its right to tax non-residents who work in Detroit. Jones said, “The conspiracy that led to this bankruptcy began with the pretense of a ‘consent agreement.’ Then the unions came up with many cost-savings in negotiations that were done in bad faith by the state. Objector Carl Williams noted that PA 436 never received a two-thirds vote as required to overturn a public referendum, the repeal of PA 4. 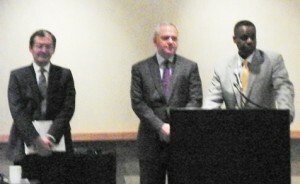 (L to r) Bruce Bennett of Jones Day, contractor Kenneth Buckfire, and EM Kevyn Orr at meeting with creditors June 14, 2013. 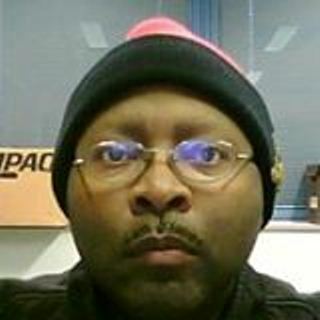 He added that Orr cannot reach a debt adjustment plan on his own, that it must be approved by the bankruptcy judge. To date, however, Rhodes has concurred with Jones Day attorneys on virtually every issue. See video below from Channel 4–Bing upset with EM. Well, who let the dogs out? There has been a misprint or misquote on my statement and I would like to make a correction. What said was that P. A. 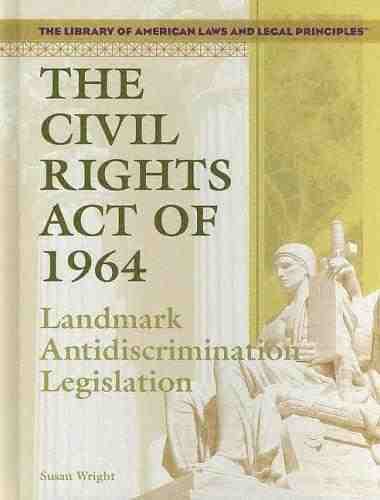 436 didn’t received the constitutional 3/4 votes required by Article 2 Section 9 of the Michigan State Constitution. I didn’t mention the 2/3 votes.